For me, there is nothing like directing; the rush of arriving on the set at the crack of dawn, the anticipation to get that first shot in as the crew sets up, the anxiety that creeps in when a scene takes longer to shoot then you expected and the AD looks at her watch for the third time, the high you get when a camera moves gracefully and your actors convince you the world they inhabit in the scene actually exists and the numb exhaustion at the end of a very long intense, decision-filled day. Directors can relate to this regardless if what they are making is a shlock horror flick, an art-house drama, a hard-hitting documentary expose, a funny commercial, a psychedelic music video or a corporate industrial. In fact, directors love the work so much they would do it for free (ok, for deferred payment) in the hopes that they can actually make a living, day in and day out, directing. And the only way to get there is by directing more and more stuff and getting better and better. It's all about the end result; you need to know where you're going before you get there. I'm always surprised by how many filmmakers still don't think about where they want their film/video to be seen and in what format. At best, they have vague notions like "top film festivals" or "the internet." Then what ends up happening is that the unprepared director ends up bending to the whims of her final piece; "I originally wanted it to go to Sundance but I shot it too late to submit, oh well... I'll just send it to the next available one, whatever that is." How much happier would this director be if she planned to shoot sooner to actually make her deadline? Or after planning, realizing that she can't make the deadline and would be better off targeting another festival? Besides thinking about where you want to end up, think about how you most want your film/video to be seen; whether it's on television, online, on a phone, projected in a theater etc. Although eventually all works get seen on all media, thinking about the main one (for ex. theater screen) will inform and influence the technical, logistical and creative choices you make throughout your production. Depending on the type of production, you will either need a script (narrative short or feature, commercial, etc. ), a concept (a live event, some music videos, a Vine project, etc.) or a proposal with a working hypothesis, a set of questions and collected research (documentary, journalistic piece, etc.). After visualizing the end result, your script, concept or proposal is the blueprint that will interest people to work with you and help you make it. You need it. The only types of film/video that I can think of that don't require a script or even a concept are unexpected news events captured by bystanders, like the Zapruder film. What genre does your script / concept / proposal fall in? Choosing the genre for your script will help you make some additional creative choices, particularly on whether you will uphold or defy conventions and how. After choosing your genre, what will be the tone of your film? It will be some degree of serious/dramatic, funny, sad, tragic, epic, weird, ironic, elegaic, etc. Knowing the tone of your film will limit what you can do but also focus what you can do with your project, giving it a style. For example you can choose to make your action genre film funny (Indiana Jones) or serious/dramatic (Die Hard) or epic (300). Although it's usually not recommended to mix too many tones in your film, there is no hard and fast rule and some directors make their name mixing genres and tones... so hey, maybe you wanna give it a try. Filmmakers who don't secure their locations early on in the process usually suffer lots of headaches. Locations are a big deal and it's hard to prepare the look of your film without knowing the space it will be contained in. Know early on where you're shooting so you can start visualizing ASAP and making the necessary production design changes to your script that will give you the end result you seek. With your locations in place, you can now go through your script and break down every important element of your production. Don't be lazy and skip this step, even if the project is a simple music video. Remember as a director, you should be immersing yourself in the project not finding reasons to be lazy. There are a number of ways to breakdown a script and it's fine if you don't do it the industry standard way, as long as you do it in a commonsense way that lets you list and organize the breakdown from scene to scene. As you wrote the script, you probably already had a ballpark figure for an overall budget of what you can or are willing to spend. After doing the breakdown, now you know exactly what you're going to spend that money on and how much you really need. After creating the budget, you will either modify the script or breakdown to meet your low budget, figure out ways to work with the budget you have or get more money. Although there is no start- or end-point to the things that influence us in our lives, I like to actively seek out influences for the current production once I've finished the budget. At this stage, the limitations of script, location, breakdown and budget are set, so I like to return to the things that inspired me to make the project in the first place or discover new things that can enhance it. This usually means taking notes as I watch movies, listen to music, view art and photography, talk with people, etc. and something always comes up during this step that eventually makes it to the final piece. I like considering any visual or audio-musical influences before getting into the storyboard, precisely so that all those influences can co-mingle with the ideas I've already decided I want to implement in the storyboard. Remember, the storyboard is not a bible, it's only a visual aid meant to trigger your shot flow ideas and help you with the shot list. It can even be a rough sketch. You don't have to rely on it for every step of the shoot since you do want to remain open to on-the-set inspiration but it's nice to have one when you are stuck in a rut so you can at least get the shot you originally visualized. I also like storyboarding at this stage so that I can have a better grasp of my shot list and schedule. For those that don't like storyboarding or have run out of time to make one, at the least, decide on the visual style you're going for. Create an image board or a binder with art works, photographs or film stills that best represents that visual style and share it with your DP, editor, producer and cast. "A picture is worth a thousand words" is a quote that has never been truer than for a director on the set trying to communicate what shot she wants. You might not want to carry around the storyboard everywhere you go or share it with the key people in your crew but your shot list is a different story. The shot list is your to-do list for the day. You need a shot list and the key people must have it. With it you will track your forward progress or alter it to adjust to mishaps while you shoot. Now that you have your breakdown, budget, storyboard and your shot list, you can make an accurate schedule. Work backwards from any pending deadlines / due dates or cast / crew / location availability dates. Factor in the weather for exterior shots, shooting at odd hours, make-up, costume, art design and lighting/camera set-up times and travel time to multiple locations so that you can pack a day with work efficiently and cost-effectively. Even if you have an AD, a line producer and a production manager taking care of this, you should have a hand in making it. Depending on the project or the cast you might have to do extensive rehearsals. Even if you don't plan on rehearsing the actors, you will rehearse the stunt crew. Rehearsing is highly recommended for dangerous stunts, no matter how experienced the choreographer and stunt person are. I love rehearsing with actors and I think it helps me find additional visuals to consider or reconsider in the storyboard. However, some actors don't respond well to rehearsals (which is something you should have figured out during auditions) so you won't do it with them. However, even if you did lots of rehearsals with your cast, it doesn't guarantee that you still won't come across an acting problem on the set. The only way out of those dilemmas, besides rehearsing with your actors, is to have a distinct directing style that works for you. 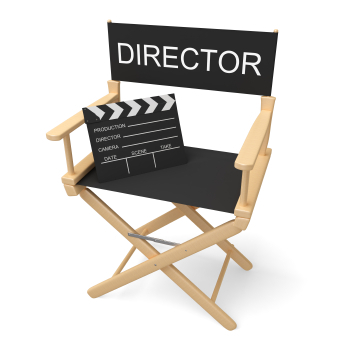 The directing style is your method of helping an actor (trained or untrained) become believable in their role. The directing style has to gel with the actor's training and understanding of the world; do they respond to vivid and descriptive imagery and direction in playing their roles or do they prefer that you to tell them EXACTLY how to do it with mimicry or should they "just be themselves"? If you did your job right during audition, you chose actors that you can understand and communicate with, will complement your directing style and lessen friction on the set. For live events and documentary, your directing style is more about capturing engaging material, emotionally evocative moments and surprising scenes. So it will require you to be alert to your subject's mood, the aesthetics of your surroundings and the ebb and flow of a crowd (if any) to get in the zone while directing live on the spot. Ideally, you want to test as close to actual conditions as possible. To do so, you will perform the test shoot with the actual equipment you are using at the actual location at the actual time of day you expect to use it during your production. During this time, you will be able to test out all the major shots you envisioned in your storyboard including ideas sparked by your influences. That is the ideal scenario. More than likely, you won't have the luxury of time or the camera, DP and location available to test how you want. In that case, you should at least try out complex shots with a cheaper camera (maybe even your phone) and use toys and action figures as actor stand-ins. Don't overlook this step because it can let you know if a shot you were influenced by or set down on your storyboard can actually be done or help your overall script and end-result. When you wrote your script, developed your concept or fleshed out your proposal, you should've already unwrapped the underlying theme of your production. Now is time to take that theme and turn it into one or two keywords that you will place all around your directing paraphernalia; your script, shot list, storyboards, camera (or monitor). The point of doing this is to create constant reminders of what your production is ultimately about. Whenever you get stumped by a difficult creative decision, ask yourself which of the available options will most highlight or support the theme of your entire production. aka "The Big Maybe." Hopefully you never have to do this step when you direct but you should steel yourself for the possibility that you might have to reschedule in the midst of production or reshoot after wrapping. So it's best to be proactive, accept that it could happen to you and have some plans in the backburner for that eventuality. Preparing for this eventuality also means that you factored it into your budget and schedule, too. Direct like this enough times and the work flow becomes an expression and reflection of your style and personality. By then you will have internalized the process in a way that works for you and earned a reputation for being a good working director. But it all comes down to being prepared before shooting because those that make a living as directors know that "behind every great production is a great plan."